When I was in the 8th grade I had my first opportunity to attend a church lock-in. We gathered at 6pm on a Saturday evening and had an amazing agenda planned by our very thoughtful and eager team of youth ministers. Our evening was filled with group activities, scavenger hunts and group discussions. There was music, food and fellowship that stretched into the early hours of the morning, until we all finally succumbed to sleep (I think we got 3 hours sleep max!) Over the course of our fun filled evening we did as most teens do, we gave each other nick names. Those nicknames were born from the experiences and activities we were doing that night. I remember my best friends ended up with the nicknames “Breezy” “Longefellow” We moved through team building experiences, we debriefed them, we completed puzzles and problem solving activities and at the end of the evening I too had a new nickname …. “Worrywart” … I earned this nickname nearly 35 years ago and guess what…. I’m still a worry wart. I cannot seem to help myself. Don’t get me wrong, I do understand logically that worry is not a good use of my energy, but still, I asked a lot of “what if” questions. In fact, in response to a series of “But what if…” questions I was once told “Amelia, if we sit here and kick the lid off the ‘what if’ can we’ll be here all day!” I can stay awake at night playing thru scenarios in my mind… if this happens then that…..but what if that happens instead? …etc etc I can work myself into a stress spiral faster than you can say worrywart. I do not think I am alone in this tendency to worry, I think I live in a world full of worriers. There is some comfort found in playing through various possible outcomes to feel as prepared as possible, because if nothing else, I want to hold on the idea that I am in control right? I’m prepared! But in reality I know this is not true…there is someone much bigger and greater than me in control, not only that He wants me to cast my cares, my worries on Him! In fact, if I trust in Him and let go and let God, He will give me peace, something this worrywart values more than I can say. 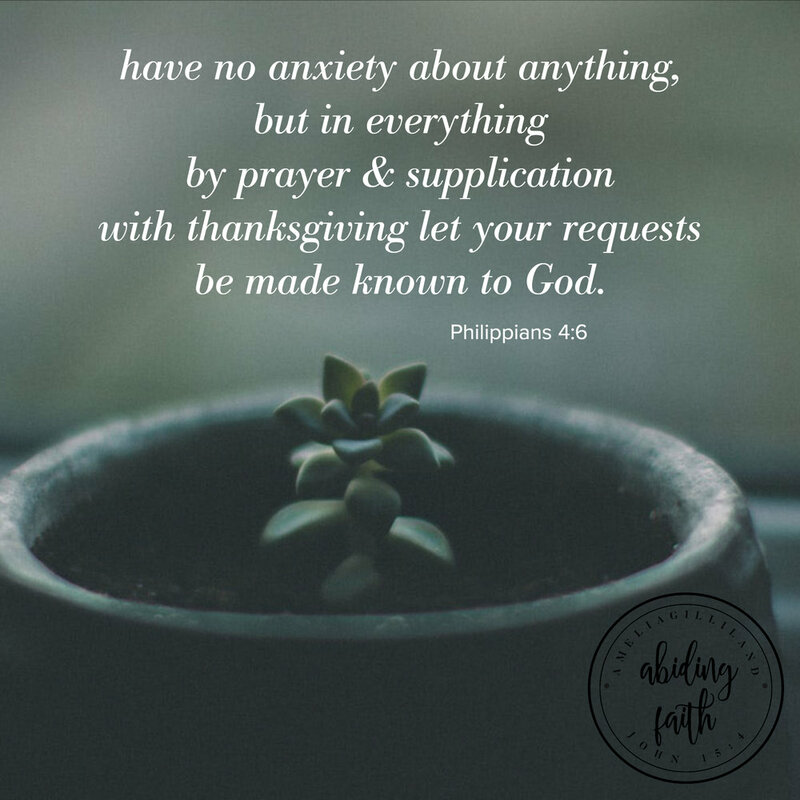 What about you, what are your go to passages for those times of worry and doubt? I would also love it if you left a link below to what is inspiring you this week.